The Indian Institute of Science (IISc) Bengaluru has maintained its 27th position in Times Higher Education (THE) Asia Rankings 2017. The institute, which for the first time had broken through the top 30 barrier of THE Asia Ranking last year has upheld its position this year too. Besides IISc, there are as many as 33 Indian institutions including IIT Bombay, Veltech University, IIT Delhi, IIT Madras, IIT Kanpur and IIT Roorkee which have been listed in THE Asia Ranking 2017. Further following last year’s trend, there are as many as eight universities in the top 100 Asian universities. 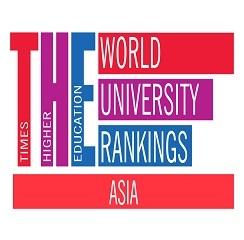 Moreover, Veltech University which was nowhere in the THE Ranking list till last year has made its appearance in this year’s THE Asia ranking at 43. However, several of the Indian Universities have stepped down in THE Asia Ranking 2017 from their last year’s ranking, where IIT Kharagpur has faced a major blow in this regard as it is positioned at as much as 31 ranks below from that of last year. According to the THE Asia Ranking 2017, IIT Kharagpur is ranked at 87 while it was at the 51st position in previous year’s list. IIT Roorkee has missed its last year’s 65th position by five ranks and is placed at 70th position this year. Further, IIT Guwahati and Jadavpur University which ranked 80 and 84 respectively last year have found their positions in between 101-110 in THE Asia Ranking 2017. With Times Higher Education expanding its ranking base from 200 to 298 universities, the representations from Indian Universities have also increased to 33 from that of 16 last year. Veltech University, NIT Rourkela, Amity University, Cochin University of Science and Technology, Manipal University, SASTRA University, SRM University, Satyabhama University, and VIT University are amongst the 33 new entrants in THE Asia Ranking 2017. According to THE Asia University Ranking 2017, National University of Singapore tops the chart once again after the 2016 University Rankings. The university is closely followed by Peking University and Tsinghua University, China. Surprisingly, for the first time in three years, Japan has the maximum number of universities with 69 universities in the list.